It may sound like a generic question, but many business owners don’t even know why they do what they do, and why their company exists, beyond selling more products or services. They start a new business knowing what they will sell, and how they will sell, without understanding why they are doing it, in the first place. You may be surprised, but defining a clear purpose is much more than a generic statement, and this is what truly successful organizations do differently than the rest: They start with their ‘Why’. In order to make your brand stand out from the crowd, you need to have a purpose. And it must be more than just a quick slogan drafted by the marketing team. It must be a cause or belief that motivates your business in the everyday decisions. It comes from within, from the heart of your corporation. 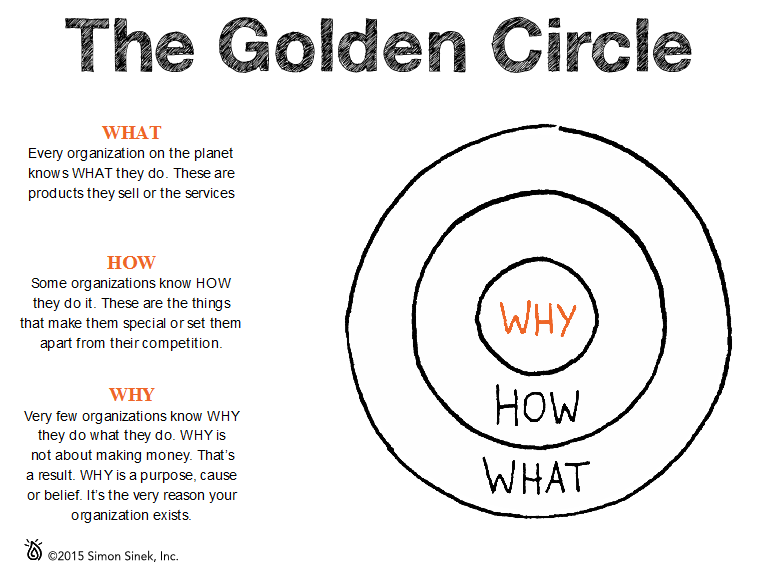 To simplify, let me introduce you to the Golden Circle of Simon Sinek. The vast majority of businesses think and act from the outside in – They do it backwards. First, they define ‘what they do’ and then they determine ‘how they do it’, leaving ‘why they do what they do’ behind. However, Simon Sinek, the creator of the Golden Circle, discovered that the inspiring leaders all think, act and communicate from the inside out. And that makes all the difference. In fact, that’s how most businesses communicate, and how most marketing is done. Chances are this is also how your business has been communicating for years. So how do you change this? The secret lies in finding how to convey your message starting with your purpose. Understanding how Apple actually connects with its beliefs can help you get started in recognizing how your message to your customers can be more powerful if you too define your why. Are you stuck? Don’t know what to answer? In the next blog I will have some detailed steps you can take to find your why. It may take some time and practice to answer this question. Just remember… Finding your business purpose is the first step in creating a strong and successful brand. Do you need guidance finding your why? We help businesses defining their purpose and creating a strong brand. Schedule a free strategy session with us today!